ISM launched the CPSM® program in May 2008. The CPSM® is recognized globally and defines you as a Supply Management Professional around the world. The CPSM® is the professional credential that leads you into the decision-maker role compelling you to generate strategic solutions. You will have the capacity to effectively manage projects, whether you work in the non-manufacturing or manufacturing sector. The CPSM® ‘s emphasis on Supply Chain Integration is what allows you to continually evolve in the rapidly changing area arena that is Supply Management. The primary purpose of this certificate program is to prepare you to sit and pass the three CPSM® exams which are divided into three modules as detailed below. The multidimensional expertise demanded by this program will give you a macro perspective of strategic sourcing, cultural awareness, risk and compliance issues, organizational global strategy, logistics and social responsibility. Knowledge in areas such as finance and benchmarking of global suppliers is also covered in this program. The integrated skill set required to reach the professional designation in areas like commodity management, supplier diversity and supplier relationship management will drive value in every link in the Supply Chain. For a detailed layout of each of the three modules – please click on the PDF. The CPSM® is a “niche” program geared toward those in the procurement field. Participants working in Supply Management, sourcing, procurement and/or purchasing or are desirous of moving into one or more of these areas would be ideal for this program. After participating in the SCE e-Learning programs, the to become a CPSM®, the participant is required is to pass all three exams as noted above (minimum score of 400). Additionally, there are two options to certify – (1) have three years of Supply Management work experience with a four-year Bachelor’s degree or (2) have five years of Supply Management work experience. Module 1 and Module 2 –has 165 questions and Module 3 has 180 questions. The Module 1 and 2 exams are 165 minutes duration and Module 3 is 180 minutes in duration and are offered through Pearson Vue Testing Centers. Be sure to ask about our new: “Colleagues Learn Free” program! Testing is on-demand as long as there is an available space at the testing center that you have selected. For exam registration and membership info, please contact ISM directly at: 800-888-6276 or 480-752-6276. 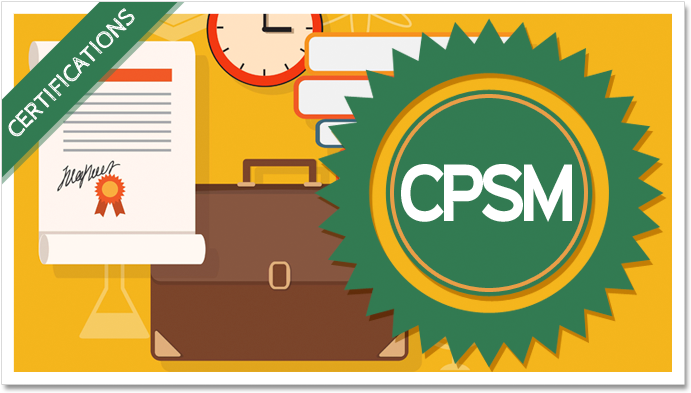 From the date at which you are CPSM® credentialed, you are required to obtain 60 hours of training over a three year period. This must be done for each three year period. SCE offers and assortment of affordable online courses to meet this objective. Please click on the Courses tab for more details.